Disabled paddlers who need assistance getting into canoes or kayaks and getting launched will find life is a bit simpler these days at Bishop Lake in the Brighton State Recreation Area. A unique launch kayak launch system has been installed there that allows paddlers to move smoothly from wheelchairs into their boats while on a dry and a stable platform, from which they can guide themselves easily into the water. The new EZ Launch Accessible Transfer System, as it is called, was funded by a grant from the W.K. 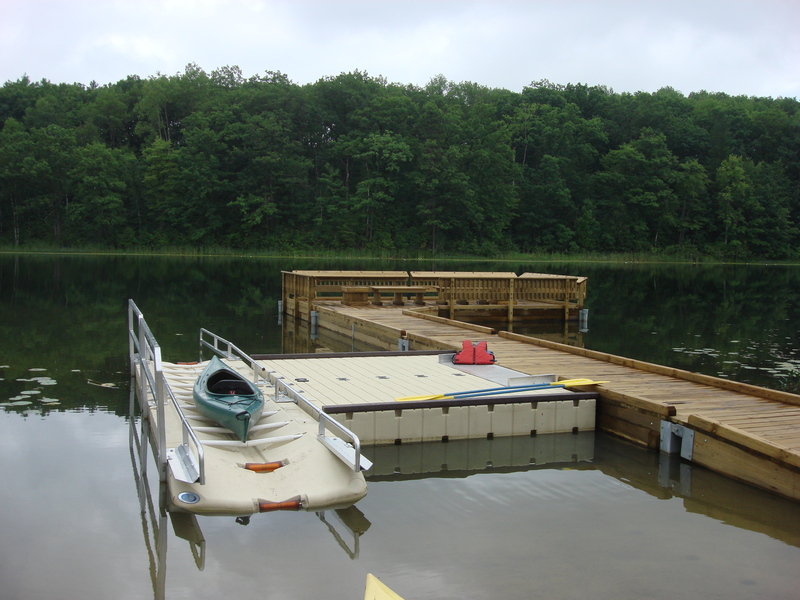 Kellogg Foundation “Access 2 Recreation Initiative.” The launch platform at Bishop Lake is the second of two installed at state recreation areas. The other is on Grebe Lake in the Rifle River State Recreation Area. Donnelly said the launch system at Bishop Lake can be used by able-bodied paddlers as well. He expects it will be a hit with many of the paddlers who come out and explore the waterway. The Brighton State Recreation Area also has an ADA accessible riding stable where a mechanical device helps riders mount horses along with a one-mile plus woodland trail for those in wheelchairs. The 4,947 acre area is located in Livingston County. It has five campgrounds, 40 miles of trail for equestrians, mountain bikers and hikers and four rustic, family cabins, one of which is accessible. Rifle River State Recreation Area Rifle River State Recreation Area also has a variety of accessible attractions. The 4,449 acre area in Ogemaw County has seven lakes, three ponds and seven miles of trout stream . It has almost 15 miles of trail, five campgrounds and five accessible rustic cabins. “It’s a similar situation there but we focus more on hunting and wildlife interpretation,” said Lord. “There has been some trail surfacing and improvement and we cluster these opportunities near each other so people can do more than one thing. Brighton’s new canoe and kayak launch system cost $27,000 to install, according to Lord. The Rifle River project cost $95,000 and was combined with the construction of a handicap fishing pier. This entry was posted in Uncategorized and tagged ADA, ADA accessible, Americans with Disabilities Act of 1990, Brighton State Recreation Area, Canoe, DNR, Grebe Lake, Kayak, Michigan Department of Natural Resources, Paddling, Rifle River State Recreation Area, W.K. Kelogg Foundation, Wheelchair. Bookmark the permalink.